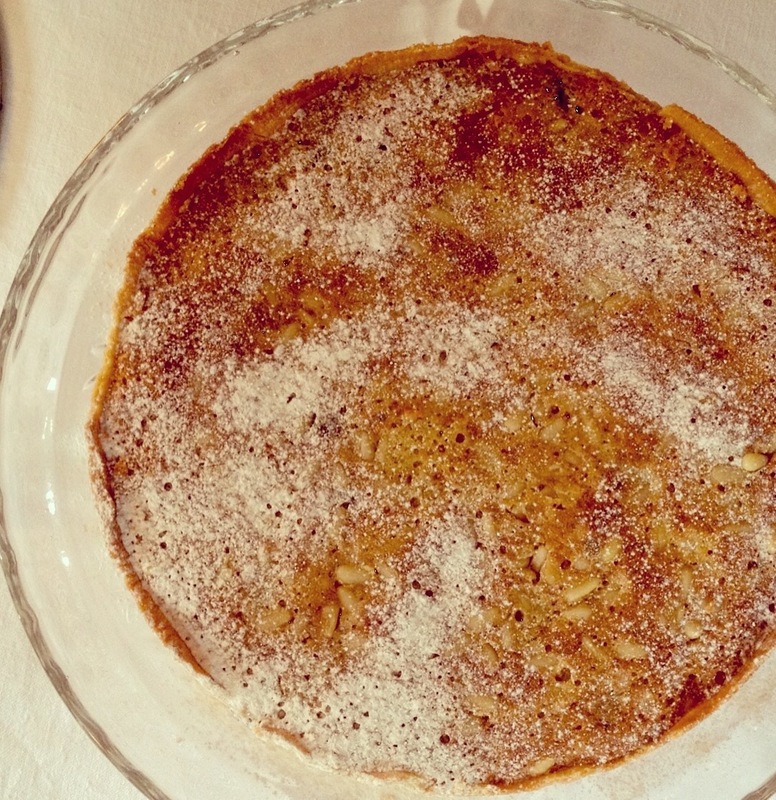 This pine nut and almond tart is one of those unassuming looking desserts that both surprises and delights as soon as you take your first bite: light crisp pastry with a golden almond filling, the crunch of the pine nuts and the rich softness of the kirsch soaked sultanas. Perfect for a lunch or dinner party dessert, or simply as an afternoon treat with a cup of tea or an espresso. I love this Rick Stein recipe with boozy sultanas but you could omit them and try the Leith’s version with a layer of cherry jam between the pastry and the almond sponge instead – it’s a kind of posh Bakewell tart. One slice won’t be enough! Pastry: 175g plain flour, small pinch of salt, 50g icing sugar, 100g chilled butter, 1 egg yolk, 1-2 teaspoons of cold water. Filling: 50g sultanas soaked in 2 tablespoons of kirsch, 100g unsalted butter, 50g golden caster sugar, 2 medium eggs, 50g ground almonds, 100g pine nuts. Mix the sultanas and kirsch together and leave to soak for 2 hours. Turn them now and again to ensure all the alcohol is absorbed. To make the pastry, sift the flour, salt and icing sugar together and then rub in the chilled butter until it looks like fine breadcrumbs. Stir in the egg and enough water to make a dough. Turn it out on to a lightly floured board and knead together briefly. Shape into a ball and press it slightly flat. Wrap in cling film and leave to rest in the refrigerator for 20 minutes. Roll the pastry out between 2 sheets of clingfilm – this will prevent it from sticking and allow you to roll it out quite thinly. Use it to line a loose-bottomed shallow 22cm flan tin. Prick the base lightly with a fork and leave to rest in the fridge for another 20 minutes. Preheat the oven to 200°C. Line the flan tin with crumpled baking parchment and cover the base with baking beans. Bake for 12-15 minutes. Remove the tin from the oven and then remove the paper and baking beans. Put it back into the oven for another 3 to 4 minutes so as to avoid the dreaded ‘soggy bottom’! Remove and set aside. Turn the oven down to 180°C. Make the filling by creaming the butter and sugar together. Gradually add the beaten egg along with a tablespoon of the ground almonds to prevent the mixture from curdling. Add the rest of the almonds, the sultanas, kirsch and 3/4 of the pine nuts. Pour the filling into the pastry case and spread it evenly. Scatter over the remaining pine nuts. Bake for 25 minutes until the top is golden. Cover the top with a little crumpled foil if it looks like the top will will burn before it cooks through. If a skewer inserted into the centre comes away clean, it’s done. If not, leave it to cook for another 5 minutes. Remove from the oven and leave to cool. You may wish to trim up the edges of the pastry to neaten it up at this stage. Once the taste has cooled down, carefully remove it from the tin, slide it onto a serving plate and dust it lightly with a little icing sugar. Best served slightly warm with with a little whipped cream. Perfect with an espresso! This entry was posted in Cakes & biscuits, Desserts, Recipes and tagged boozy sultanas, ground almonds, kirsch, pine nut tart, pine nuts, sultanas, sweet pastry. Bookmark the permalink.